The key for a safe recommendation for storage drives for photographs, it seems to me, is to find companies that see reliability the way you want them to see it. I.e., not in terms of "acceptable rates of failure" or of skewing the balance toward the lowest price per GB—yet not something that's so wildly expensive that you'll never buy it. You just want a company that for whatever reason strives to bring its failure rate to zero. The companies that fit this profile best in terms of hard drives are those that specifically cater to the professional A/V market. Of course, still images don't have to stream, so you don't exactly need terrabytes of storage in a single box, e-SATA interfaces, or 15,000 RPM spindle speeds (or Firewire 800, really). Fortunately, one of the best-known A/V hard drive manufacturers, Glyph, also has a line of 7200 RPM Firewire 400 drives specifically designed for storage. They're called NetDrives. There is nothing sacrosanct about the 300GB size model. It simply seems a decent compromise between low cost per GB (about $1), the fact that you want to limit your data loss in case of catastrophic failure at least somewhat, and yet also the fact that you don't want to use up all your ports with a slew of little tiny 80GB drives or whatnot. Any size will do; take your pick. As for an alternative, I'm told that the Avastor (also, as the name implies, made for the A/V industry) are also very reliable. Like the Glyph GT series, they use internal power supplies (IEC power cords, which you want, because it means there's no wall-wart and the cords are easily replaceable) and are fan-cooled. 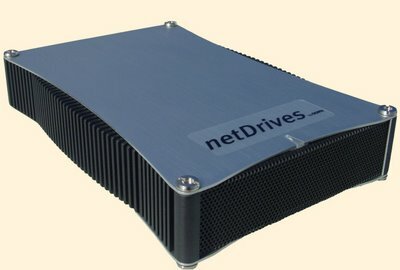 Are NetDrives immune to failure? No, I suppose not. And may I just please point out that I am not personally responsible for those few Glyph and Avastor drives that may happen to fail? Still, I think this is perhaps the safest and best possible recommendation, given the current SOTA. That's my take, anyway, as of now. Interesting- I have never heard of these drives and I work in the AV field. I think what is most important is the drive itself and the enclosure. Do they manufacture the drive or simply make the enclosure for a Maxtor, Western Digital, Quantum, Seagate. drive? Is the Firewire bus a good one? Fan cooling? I have been using about 12 Lacie D2 (160 0r 250GB) drives for video for five years and many student projects with very few failures and zero unrecoverable items. I have also heard good things about G-Raid by G-Tech. I think for ease of storage with multiple drives the Weibetech enclosures and Western Digital drives work well and can be set up as a RAID for backup. It's a pretty safe bet these guys aren't manufacturing their own drives (if they were, I'd not buy them; I'd rather trust a huge manufacturer with lots of resources on development and testing). That said, the choice is not inconsequential; they in turn choose what components (drives, power supplies, interface circuits) to use based on where they want to be in the price/performance/reliability space. Avastor uses Hitachi and Western Digital drive units; I think Glyph uses Seagate. Also, I think I'm wrong about the NetDrives having internal power supplies. I'll correct the post as soon as I get confirmation. The Avastor drives definitely have internal power supplies. Its funny you should be mentioning back up drives, I woke my G4 yesterday to hear 'beep beep' coming from my second media hard drive. The drive didn't appear on the desktop to my horror as it contained over 50GB of photographs from the last 2 years. Fortunately a shutdown & restart kicked the drive into life and I was able to back up the last 30 days of photos onto my external LACIE 250GB drive. I back up monthly but this turned out to be 2.7 GB of pictures! You can't stress enough the importance of backing up regularly - digital is great, until the drive fails and the data is gone. You can get the exact same quality external hard drive backup for about half the cost by building it yourself (300 G for $150 or less). Buy the internal hard drive of your choice and buy an external enclosure (I like the aluminum ones with both USB and Firewire). Cases with fans are available but this is not a prioroty item since external hard drives should never be left on when not in use. Turn 'em on, copy data, turn 'em off. Assembly is easy. Plug them in, let your operating system format them and they're ready to use. An interesting variation is to build an external drive using 2.5 inch laptop drives. They're much smaller and many of cases for these are powered by the USB/Firewire port so you don't need a seperate power supply. Very portable. 80 to 120 G for around $125. Hard drives will go bad, regardless of who makes them and the quality of the components around them. My advice is to use as many disks as you can afford to back up your data, as well as multiple methods. The trick is to make sure that you can survive the loss of one or more sets of back up media. For instance, if I could afford it right now I would buy two of these disks and put a copy of each file onto both disks. In addition, I would store them online at my smugmug account. Using CDs or DVDs is also not a bad idea, although it admittedly gets tedious and the media goes bad more often than I'd like. I work in the disaster recovery industry, building systems that are used mainly in the financial and insurance segments. In my business, losing data is never acceptable, and we talk about downtimes in the area of a few minutes every year. 1. Drives die. Regularly. While it's nice for a drive manufacturer to strive "...to bring its failure rate to zero", it is the responsibility of the person using the drive to recognize and plan for its inevitable screeching failure. 2. As drives age, they are more likely to fail. Remember, these are mechanical systems. Parts age and stick. I'm not really advocating everybody run out and buy RAID enclosures: I'm just trying to stress my original point. Never depend on the reliability of a single hard drive. Never depend on the reliability of hardware, at all. Build redundancy into your processes, and make sure your contingencies have contingencies. One other minor topic: backing up to CD/DVD is nice and convenient, but the media failure rates are appalling, even for the best media. And even though a CD is not a mechanical system, it is chemical, and has the same characteristic: failure rate increases as disks age. 1: Back up the same data to multiple CDs. 2: Keep a reliable catalog. On the other hand, yeah, the NetDrive enclosure is nice. I couldn't find out what kind of drive they use. I have to agree with the above poster who says to roll your own drive. It's frustrating but much cheaper. to replace a enclosure that failed. The quality is reasonable and they are very cheap. The weird thing is that they both have firewire ports on the back, but that's not advertised. Anyway, the point of all this to me is that all drives fail and the best solution is to have more than one backup. I had a drive fail that I was in the process of backing up (i.e. I lost everything), so I've become a little more careful about this, although I'm still working on my workflow. My solution: two working backup harddiscs that I keep near the computer, that I maintain regularly, one other backup that I don't keep attached to the computer, and then (this is the new part) continually burning dvds of new files as they come and sending them to my parents to dump into a box. Oh the other rule is no 2 hard drives plugged in at any one time. It's kind of obsessive but in the end I should be able to recover everything up till the last DVD I burn. What I am searching for at this time is a box with at least 2 harddrives so that my data is always mirrored (raid-1). I have found that I have basically have 2 choices, a NAS box that sits on the network or some sort of server. They both have their pluses and minus, and I am still picking various peoples brains for information. I'm currently using two Lacie 250G USB 2.0 drives, but not connected directly to my laptop. Instead, they are hosted on a Linksys NSLU2 NAS server, which you can get for less than $100, and which appears on the ethernet LAN as a mounted hard drive. One physical drive is primary, and the other backs up all the primary data once a week, scheduled by the NSLU2 local web-based setup. The first mirror operation copies the entire drive, and after that, it only copies recently changed files. I put files on the primary drive manually, when I copy pictures from the camera compact flash onto my laptop. I found out though, that it was a good idea to leave working copies on the laptop, rather than editing ones from the NAS-mounted drives. As good as the NSLU2 is, it is relatively slow (runs on a 100 MHz ARM processor), so Bridge, et al, run glacially over the mounted drive. As long as you edit your pictures on your local system, and use the NAS drives as backup, it works quite nice. You can also set up the NAS to automatically back up, for instance, your 'My Documents' directory on your system, but since I rarely leave my laptop running when not in use (I close the lid and let it hibernate, saving on the light bill and wear and tear), then scheduled backups wouldn't work very well for me. The NAS 2-drive array stays powered up, though, since it serves a couple of other machines in the household. It takes the place of a Linux-based AMD K6 2-450 file server I've had running since 2000 in the basement, for a fraction of the electrical bill. If I leave on a trip, I can power down the drives and stow the spare some place off site. Variations on this theme suggest themselves, like rotating the secondary with a third drive that you routinely take off-site. Pretty inexpensive insurance, when you can get the external hard drives and NAS server for so little these days. I have such an enclosure for a harddrive and for a DVD burner and I find them to be of very good quality. The power supply is indeed external. I however don't think they are built by Glyph but must be generic and rebranded as they are the same as Mapower's or Samcheer's enclosures. Well, there you go! I had a failure today, but it was not the hard drive. The Lacie d2 would not mount or be recognized, so I took the HD out of it's enclosure and into another "good" enclosure, viola. it mounted. Obviously the firewire bridge failed. Mind you this a 3-4 year old hard drive, so it was not unexpected. I am currently transferring the 85GB to a newer drive.